Xiao Birrings, an 8 year old worker at a clothing factory just outside Beijing, has become the world's youngest leader of an international charity. “When I heard of the plight of the middle-managers in South East England I was in tears,” said Xiao during his five minute lunch break. “Of course that could also have been caused by the noxious fumes from the dyes we use to make Western Children's clothes,” he added. Master Birrings said that he could really empathise with the group of IT professionals who were faced with having to travel an extra ten miles by heated transport to get to work each day or face redundancy. 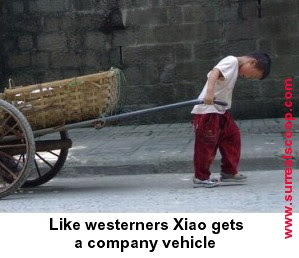 Xiao said that he was lucky to have his fourteen-hours-a-day job of repetitive manual labour in sweltering conditions and fully understood why a five figure sterling payout was scant compensation. Xiao and the other members of his factory said that the plight of those in Kent was a warning to people around the world in the struggle for more equitable working conditions.